Enriched essential oils of Holy Basil and refreshing Mint. The sacred herb Basil is believed to harmonise mind, body and spirit. It has immense health and spiritual benefits invoking a sense of purity. 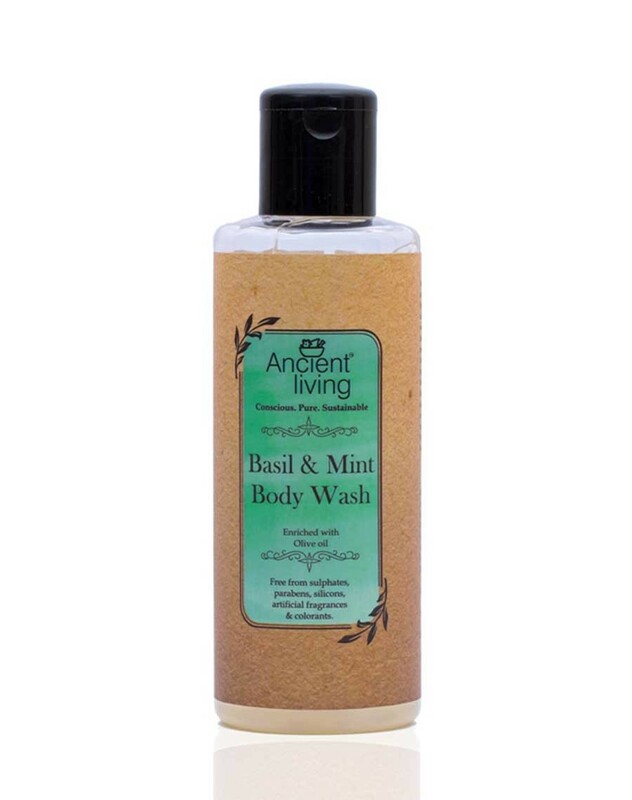 Ancient Living Basil and Mint Body wash is a gentle body wash enriched with the essential oils of Holy Basil and refreshing Mint. The sacred herb Basil is believed to harmonise mind, body and spirit. It has immense health and spiritual benefits invoking a sense of purity. Mint has a beautiful herbaceous scent and is a cooling herb. Its creamy lather thoroughly cleanses the skin off impurities and prevents skin eruptions. Menthol provides a beautiful cooling effect. Moisturising Aloe Vera and gentle Olive condition your skin. Natural Vitamin E present helps fight free radicals and prevents premature aging. The rich, spicy and invigorating fragrance refreshes you instantly.